I love Sundays in December...advent candles, singing carols and messages about our Savior's birth. We had a great morning at church, came home and rested (all of us) and then went and did a couple more RAKs (random acts of kindness). We took baked goods and granola bars to the local fire station and placed some $1 bills in the toy section at the dollar store. Perry had fun meeting the firemen. Sunday night we got to spend time with our friends Travis and Gina and do some fun Christmas activities. 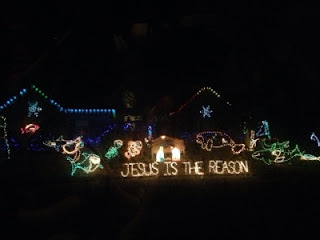 Gina had this fabulous idea of going to look at Christmas lights and leaving little notes and candy canes on the mailboxes of peoples houses that were decorated pretty. 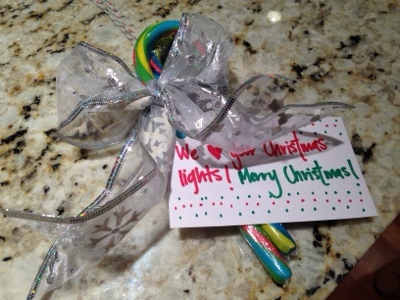 The note says "We love your Christmas lights! Merry Christmas!" There were so many good lights and it was hard to narrow it down to who we wanted to give the candy cane prizes too. 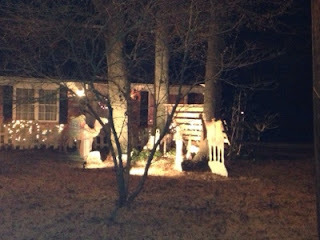 We gave some to these folks with their impressive lit up nativity scene and of course "Jesus under the sea." 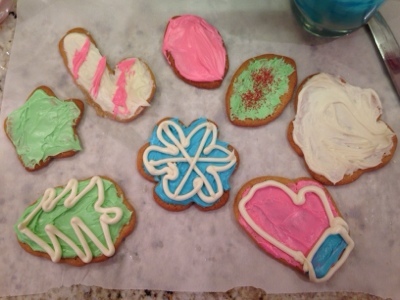 Then we went back and made and decorated sugar cookies. We did the best we could with store bought cookie dough and pastel food coloring...nonetheless they tasted great! Perry approved too. Today is Christmas Eve. Andrew has had to work so Perry and I have had a pretty low key day. We took some hot chocolate to a Salvation Army bell ringer this morning. Poor woman standing in the 29 degree weather. Then we went and strolled around Fresh Market (gosh I love that store) and went to visit grandma. Now Perry is napping and resting up for a fun Christmas Eve night. Meanwhile I am doing some cooking and getting the house in order for tomorrow. This evening we are headed to church at 4 then over to Mommyteen and Pawpaws for the annual Gibson family Christmas.